Goal attainment scaling, which tracks students' skill progression over time, offers an alternative to fixed methods of assessment. In recent years, the momentum in education has shifted assessment away from general performance on assignments and toward a focus on the skills that students need to succeed in college or careers. 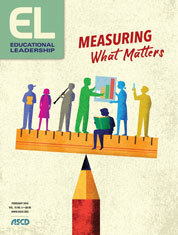 Initiatives such as the Common Core State Standards in language arts and mathematics; the College, Career, and Civic Life (C3) Framework for social studies; and Next Generation Science Standards have all contributed to the push to better define the skills and knowledge that prepare students for life beyond K–12 schools. For years, education thought leaders have pressed schools to identify and prioritize what matters most to students' learning, be it through standards-based learning, a focus on transfer skills or gateway skills, or personalized learning plans. Colleges and universities have responded to the shift as well. Grades are still important, but colleges and university admissions programs increasingly ask for more than GPA and test scores (Sternberg, 2010). We can prepare students for these more comprehensive admissions processes and for life by purposefully teaching the "6 Cs": character, collaboration, communication, critical thinking, creativity, and citizenship. The collective body of work on standards, skills, and personalized learning has sparked positive changes in classrooms, where recall of content knowledge is no longer seen as the end itself, but rather as a vehicle for more important skills. This can be disappointing for the teacher whose favorite topic is Westward Expansion and who enjoys teaching the facts of the time period. But this change in emphasis allows all students opportunities to find a passion and to develop skills and strengths by following their own interests and pathways within the curriculum. Making the shift to highlighting and improving skills instead of composite scores on assignments, however, poses a measurement challenge for educators. Traditionally, students' progress was measured by a grade on an assign-ment or test that often reflected the proportion of items correct. But the new trend in instruction compels us to measure evidence of skills development—a more daunting task. Even more challenging, many teachers are now charged with supporting and measuring students' growth on the 6 Cs and other individualized goals. To gather evidence, educators and students together need to identify a desired progression of particular skills over the course of a year and measure and communicate growth in multiple contexts. In other words, we don't want to measure a student's citizenship skills only in social studies, we also want to see evidence of these skills in many settings, in and out of school. I was first introduced to goal attainment scaling, a standardized approach for measuring progress, as a researcher. The National Institutes of Health provided funding for psychologist Lisa Ruble and me to study an intervention for students with autism (Ruble et al., 2010). We used goal attainment scaling, which is a recommended research methodology for tracking progress toward individualized goals, as a way to measure student progress on social, behavioral, and communication goals (Cytrynbaum et al., 1979; Ruble et al., 2010). Through our work, I realized that we should not reserve this methodology for research; it should be a part of the daily work in classrooms when measuring growth. Goal attainment scaling offers educators a way to communicate clearly both what is expected and at what level a student is performing on any learning or behavior goal. For example, if a student and her teacher wanted to see an increase in reading comprehension skills, they would outline specifically how the student's comprehension looks now, how they want it to look at the end of the year, and then clearly define the steps in between. Furthermore, students themselves can learn this process and become increasingly active in leading the de-velopment of their goals and measuring their progress. What a wonderful opportunity to personalize learning and share ownership of the goal-setting and assessment process with students! Goal attainment scaling can be thought of as a ruler of sorts—one that can accommodate many types of measurement. After all, not every goal should—or can—be measured using a percentage. Goal attainment scales allow us to use whatever measure makes the most sense for that goal. If a student wants to persist in his reading longer, then duration measured in minutes may be best. If a student wants to complete a certain type of task with less help, then level of independence may be the right measure. Or, if we want the quality of a skill to progress, we can use words to describe the characteristics of each step in the progression. For example, it may be more meaningful (and easier) to describe the level of support a student needs to edit writing for accurate spelling, grammar, and punctuation than to attempt to measure a percentage of accuracy with these skills. In some ways, goal attainment scaling is akin to a blending of rubrics and standards-based grading. As with a well-crafted rubric, there are levels of performance that are described explicitly. But unlike most rubrics, the goal attainment scale is designed to measure growth on a skill over the course of a long period of time, rather than for a specified, short-term task. The lowest point on the goal attainment scale corresponds with the beginning, not with poor performance. Like standards-based grading, a goal attainment scale includes levels of performance on skills to be measured over time. Yet unlike standards-based grading scales, which most often include 3–5 levels with a general description of each (with, for instance, 4 for mastering, 3 for approaching, 2 for developing, and 1 for beginning), the goal attainment scale outlines specific descriptions of steps in performance toward a goal. As a result, instead of "resetting" a scale each reporting period (to shoot for a "4" each time), one scale is used to measure continuous growth toward the goal all year. Each step on the scale is given a unique level, which allows teachers to record a student's exact location. In other words, goal attainment scaling functions like a GPS (Jung, 2017), communicating students' current location toward a year-end target. To generate a goal attainment scale, students and their teachers develop precise, leveled descriptions of skill progress. The first step is to describe the starting point for the year in observable terms. This starting point is based on classroom data about where the student is right now—the baseline. They then determine the end-of-year goal—setting the bar high—and describe this top level. Finally, students and their teachers pick intermediary points and describe these. In the example of a scale in Figure 1, there are nine increments of progress toward critical thinking on selecting and integrating information from credible sources. Educators may find nine steps to be a useful number of increments because it correlates to the nine months in the typical academic year, yielding an expected rate of progress of one point per month. Although this scale is numerical, numbers are not a required component. Colors are useful when layered over the levels, so data can be analyzed quickly. On this version of a goal attainment scale, teachers and students only define every other point on the scale, for a total of five descriptions. This simplifies the task, while maintaining a measure sensitive enough to detect nine unique steps toward the goal. Students and their teachers would use the scale by selecting the number that corresponds to the student's current performance, choosing the blank levels when a student's performance is between two of the descriptions. The scale should be written in a way that allows measurement across subject areas and contexts of everyday classroom routines and activities. With students and multiple teachers recording observations of the student's performance, it is important that the scale uses simple, precise language so that everyone understands the meaning of every level (Jung et al., 2008). The scale should ensure reliability between people who use it—that two people could ob-serve a student's performance and agree to which level on the scale the skill was demonstrated. With goal attainment scaling, teachers across all disciplines can use the same scale to measure a student's progress in any setting. The student's progress data can then be displayed in color on a data map as seen in Figure 2 or as a line graph. Representing data visually helps everyone on the team, including parents, students, and teachers, to quickly understand how the student is progressing toward the goal (Jung, 2015). When everyone presents data in the same way across the disciplines of study, the data come alive and can serve their most important purpose of informing instruction or intervention. For instance, a scale for selecting and integrating information from credible sources can be used in language arts, math, science, social studies, and any subject in which students bring evidence to support a solution, question, or position. When measuring progress, we can map data across multiple settings. Figure 2 shows a student's progress with the skill in four subject areas: language arts, social studies, science, and film. By keeping the data disaggregated by setting, we can easily see if the student is progressing more quickly in one setting than in another. We can also determine if the skill is being generalized across many contexts, indicating a stronger mastery. For instance, if the map in Figure 2 showed that the student remained at a level 3 over time in science, we would know that the skill had not been generalized to science. We would question why this is the case and respond with instructional support to promote skill transfer. Among the possible explanations, it could be that the academic language is more difficult in science or that the instructional strategies were implemented differently. Goal attainment scaling is particularly useful for setting and measuring progress on individualized education program goals. These goals are often written with a measurable criterion of a skill or behavior happening at "80 percent accuracy." Frequently, though, it is impossible to measure the student's performance using the criteria set. For example, "Spencer will organize his materials and turn in complete homework with 80 percent accuracy" appears to be measurable, but as stated, being able to organize materials cannot truly be measured in terms of percentage accuracy. Goal attainment scaling offers an excellent solution for ensuring that IEP goals are measurable, because the scale becomes the measure. In determining the highest level on the scale for a student with an IEP, teams decide on the criterion they expect the student to reach by the end of a year. Teams must choose attainable criteria, but ones that are comparably rigorous to the general curriculum expectations. For example, for a student who is below grade level in reading fluency, the goal may be to read at a rate of 80 words per minute, rather than the grade-level expectation of 150 words per minute. This modified criterion is appropriate if it's a comparably difficult—but achievable—goal for that student. If we are to move students toward grade-level expectations, we must aim high. As often as possible, our ending criteria should be in line with grade-level expectations. For the skills that matter most to students, we need to articulate a progression of development and be able to measure development across many subject areas and contexts. Goal attainment scaling offers the flexibility to use any type of measurement a team chooses and the ability to collect and present data in the same way for all students and all goals. The goal attainment scale and corresponding data map provide a snapshot that allows teams to quickly determine progress. Corresponding artifacts of student work can provide a richer, in-depth examination and reflection as well. Educators can catalog examples of student work by recording the dates they were collected so it's clear where the work falls on the data map. This examination of both the data map and examples of student work can be especially useful when a student is not progressing as expected or in all contexts. In many schools, there is a growing push to measure overarching skills across many disciplines of study or contexts. Goal attainment scaling is one viable solution for students and their teachers to choose personalized goals that reach across the curriculum and across time. This interdisciplinary attention provides the structure for communicating evidence of growth on skills that previously may not have been explicitly measured. By doing this, teams can focus on what matters most for students—the life-changing skills needed now and in the future. By clearly measuring progress on these skills, educators can respond with agility, using instructional methods and interventions to ensure all students reach their most important life goals. Cytrynbaum, S., Ginath, Y., Birdwell, J., & Brandt, L. (1979). Goal attainment scaling: A critical review. Evaluation Quarterly, 3(1), 5–40. Jung, L. A. (2015). A practical guide to planning interventions and monitoring progress. Bloomington, IN: Solution Tree Press. Jung, L. A., Baird, S. M., Gomez, C, & Galyon-Keramidas, C. (2008). Family-centered intervention: Bridging the gap between IEPs and implementation. Teaching Exceptional Children, 41(1), 26–33. Ruble, L. A., McGrew, J., Dalrymple, N., & Jung, L. A. (2010). Examining the quality of IEPs for young children with autism. Journal of Autism and Developmental Disorders, 40(12), 1459–1470. Sternberg, R. J. (2010). College admissions for the 21st Century. Cambridge, MA: Harvard University Press. Lee Ann Jung (www.lajung.com) is chief academic officer for the ASCD Student Growth Center. She consults with schools internationally in the areas of inclusion, standards-based grading, intervention planning, and progress monitoring. Follow her on Twitter.